Preface: Structures of the Anterolateral Knee: Why All the Confusion? Do We Need Extra-Articular Reconstructive Surgery? Anterolateral Ligament Reconstruction or Extra-Articular Tenodesis: Why and When? What Is the State of the Evidence in Anterolateral Ligament Research? 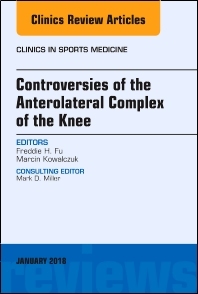 This issue of Clinics in Sports Medicine, guest edited by Dr. Freddie H. Fu, will cover Controversies of the Anterolateral Complex of the Knee. Anatomical description of the anterolateral complex of the knee; Biomechanical proof for the existence of the Anterolateral Ligament; Biomechanics of the anterolateral structures of the knee; Mechanical properties of the anterolateral structures and their clinical implications; Extra articular tenodesis in combination with ACL reconstruction; The role of an extra-articular reconstructive surgery in primary ACL reconstructions; The role of an extra-articular tenodesis in revision ACL reconstruction; The effect of an extra-articular tenodesis on the contact pressure in the lateral compartment of the knee; and The state of the evidence in ALL research, among others.